Royal Brunei Airlines (RBA) aims to significantly improve its long-haul product next year following the introduction of its Boeing 787 fleet as part of a new strategy to focus on brand in the long-haul market and price in the short-haul market, where it faces increasing competition from LCCs. The long-haul product enhancements will include 18 lie-flat business class seats on the 787s, which will be placed by early 2014 on the carrier’s London, Dubai and Melbourne routes as well as potentially to Hong Kong and Shanghai. RBA is now slated to receive its first of five 787s in Aug-2013, as CAPA first reported in Nov-2011. 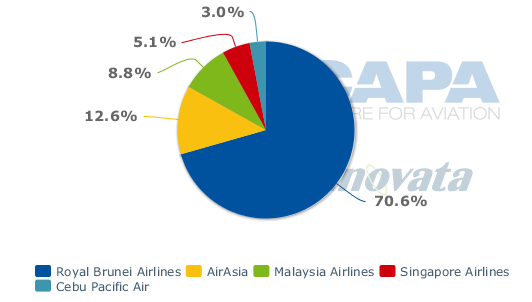 The carrier will be the first in Southeast Asia to receive the 787. RBA deputy chairman Dermot Mannion said on the sidelines of the CAPA Airlines in Transition CEO Summit last week that the carrier plans to place into service three 787s by the end of 2013 with the final two being delivered in 1Q2014. Mr Mannion says RBA’s flagship Bandar Seri Begawan-Dubai-London Heathrow route would be the first to get the 787s. He says for about six months RBA will have to operate the route with a mix of 787s and 777-200ERs until RBA receives enough 787s to transition all seven of its weekly Dubai-London frequencies. RBA’s 787s will feature a full lie-flat business class seat in 2-2-2 configuration with a pitch of over 70in. Mr Mannion says RBA’s 787s will also be equipped with Panasonic touch-screen in-flight entertainment (IFE) in both classes. Economy class will have a 33-34in pitch. The carrier recently finalised interior selections for its 787 fleet. Mr Mannion said there will be some innovative RBA-specific features and that the business class will be updated with modern seats, making it far superior than the outdated business class on its current fleet of 777-200ERs, which are leased from Singapore Airlines (SIA). RBA elected to retain the old business class product of SIA, including SIA’s IFE system, because the 777s are only an interim solution between its previous fleet of 767s and the 787s, which became delayed. After Dubai and London transition fully to the 787, RBA will upgrade its Melbourne service from 777s to 787s. Last month RBA upgraded to daily its service to Melbourne, which is the carrier’s only destination in Australasia. Auckland, Brisbane and Perth were all cut last year during a massive restructuring exercise. RBA earlier cut service to Darwin and Sydney. As a result of all the cuts to the long-haul network, short-haul routes within Asia now account for over 50% of RBA’s capacity (seats). Future growth is likely to be in the regional Asia market as any resumption of long-haul routes would almost certainly be an unprofitable exercise. The restructuring, which followed a decision to focus less on transit traffic and the highly competitive kangaroo route from Australasia to London, was completed in Jan-2012, when RBA cut its workforce by 25%. But RBA is still looking to further reduce costs through additional initiatives, including outsourcing maintenance. RBA currently has an MRO subsidiary, Royal Brunei Engineering, which does heavy maintenance up to the level of C checks on the carrier’s A320 family aircraft. Royal Brunei Engineering also previously did heavy checks on RBA’s fleet of 767s, but the 777-200ER fleet is maintained by SIA Engineering and RBA is not interested in investing in 787 maintenance capabilities. The carrier is now looking to sell its MRO business, including tooling and its hangar at Bandar Seri Begawan Airport. A foreign MRO provider could potentially take over Royal Brunei Engineering’s hangar and operation and in exchange be contracted to overhaul RBA’s fleet while also using the facility to maintain aircraft from other carriers. Royal Brunei Engineering previously pursued third-party business but in recent years has not worked on any aircraft except the RBA fleet, leading to the underutilisation of its facility. RBA also aims to reduce costs through higher utilisation of its widebody fleet. RBA currently has a fleet of six 777-200ERs that have been significantly underutlised since the long-haul network was cut back last year. RBA now uses these six aircraft to operate only 14 regular weekly rotations: seven on Bandar Seri Begawan-Melbourne-Bandar Seri Begawan and seven on Bandar Seri Begawan-Dubai-London-Dubai-Bandar Seri Begawan. RBA also uses the 777-200ER to operate a seasonal charter service to Jeddah in Saudi Arabia. Its 777s have a layover in Melbourne of nearly 16 hours. The first two of the carrier’s six 777-200ERs are coming off lease in Jul-2012 and Aug-2012. Mr Mannion says once these aircraft are returned, RBA will be able to increase the utilisation of its 777-200ER fleet to a more respectable 12 hours. RBA will eventually gain an extra widebody in 1Q2014 when its fifth 787 is delivered. The carrier is not planning to expand its long-haul operation with this fifth aircraft but instead use the 787 on some regional routes. Mr Mannion says Hong Kong and Shanghai could receive the 787. Hong Kong is now served once daily with A320s while Shanghai is served three times per week with A320s. He adds that putting the 787 on these routes would be a “huge product plus”. Bandar Seri Begawan-Hong Kong and Bandar Seri Begawan-Shanghai both have high premium demand plus RBA could potentially also offer a one-stop lie-flat business class product from Melbourne to Hong Kong and Shanghai. RBA would need to re-time its Hong Kong and Shanghai services, however, to connect with Melbourne. Currently the carrier’s Melbourne flights are timed to primarily connect with the service to Dubai and London but not Hong Kong or Shanghai. RBA is also refreshing its short-haul product with minor enhancements such as reupholstered seats. While the carrier plans to continue offering a business class product on its short-haul fleet, consisting of three A320s and two A319s, the focus is primarily on offering the lowest price. Mr Mannion says RBA’s new strategy involves competing in the short-haul market on price while focusing more on its product and brand to compete in the long-haul market. While RBA is now a tiny long-haul operator, Mr Mannion believes there is room in the large and growing Asian market to compete as a small niche or boutique carrier against much bigger Asian full service carriers by offering a good product and positioning the brand in the middle: below premier carriers such as SIA and Cathay Pacific but above LCCs. He believes it is feasible to improve service while reducing costs. RBA now competes against low-cost carriers on only two if its eight short-haul routes: Kuala Lumpur and Manila. But Mr Mannion expects more LCC competition in the Brunei market as the ASEAN region moves to open skies in 2015. Potential new LCC routes from Bandar Seri Begawan include Singapore, Jakarta, Surabaya, Hong Kong and Bangkok – all of which RBA now operates. 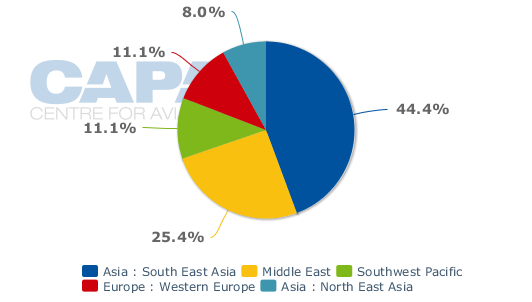 LCCs now account for 16% of total capacity in Brunei, including a 22% share on routes within Southeast Asia. Mr Mannion says RBA recognised last year it needed to adjust its strategy and reduce its costs before more LCCs enter the Brunei market (AirAsia and Cebu Pacific are now the only LCCs serving Brunei, with one route each). While there is still a premium short-haul market in Asia, Mr Mannion told CAPA’s Airlines in Transition Summit that “we can’t bank on short-haul business class” and RBA had to “absolutely” adjust its model to survive.